At the end of the road, past the observation platform, around the steel gate meant to discourage cars and up again on the berm, lies an isolated hiking path at the Brazoria Wildlife Refuge. On the east side of the berm, a ditch deep enough to provide protection from the wind allows plants to bask in low winter sunlight; it’s one of the first places I look for early-blooming flowers: coastal germander, verbena, scarlet pimpernel. Sometimes, there are surprises. 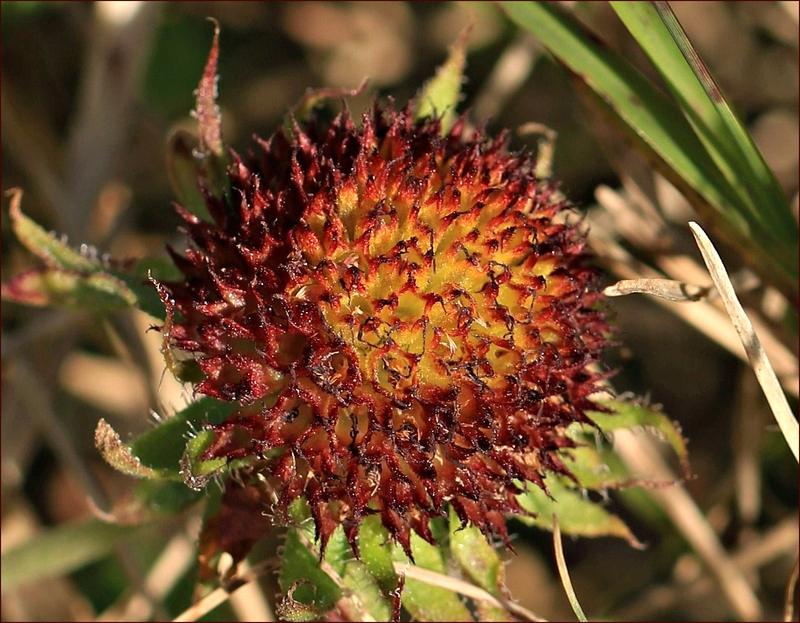 On January 27, I found the ditch filled with short and somewhat scraggly Gaillardia pulchella, commonly known as firewheel or Indian blanket. The genus name honors M. Gaillard de Charentonneau, a French magistrate and patron of botany, while the specific epithet means ‘pretty.’ Twelve species of native blanketflower inhabit the United States; at least one species can be found in every state, with Gaillardia pulchella the most widespread. Known for their months-long bloom, these tough, cold-hardy Gaillardia clearly weren’t faded holdovers from the fall. In their snug little corner of the world, spring has arrived. Firewheels have always been a favorite – they somehow look heritage and Wild West. You are right, The flowers last week were crouched low to the ground, but blooming – this week they are making no stems about it – tall and heralding. Even some white dandelion seed puffs are already towering without apologies – above the clover which is having a bumper year in yards that are too wet to mow…”knee high in clover” is having new/original meaning. Looks like the oaks are about to shed leaves – and ugh, pollen loaded and ready. I saw some of those dandelion seed heads this week. They were a little soggy, but giving it their best. It seemed to me that these flowers were short because mowing had been done sometime in the indeterminate past. In the very bottom of the ditch, where a mower would have missed things, the flowers (especially asters and verbena) were much taller. I think the gloomy weather has fooled us all. I was noticing this week that the willow are beginning to show that faint bit of bud-color, and I saw some daffodils blooming around trees out by HYC. We may think winter’s still here, but I have a feeling there’s going to be an explosion of blooms when the sun reappears. I am SO READY for Spring, Linda! Thank you for showing us that it’s coming. The weather forecasters say we’re fifty-odd days away, and that dumb groundhog indicated we’d have an early one. Tell that to Mother Nature! Of course, last night we had thunderstorms, ha!! Spring here is right on cue. I think it feels early, because things have been gloomy (if not cold), but the longer daylight hours are nudging the plants. I noticed just last week that my schefflera are suddenly covered in new growth, and so is the Christmas cactus. I’ve not heard any reports of redbuds blooming yet, but it won’t be long. I looked at your weather and saw those thunderstorm forecasts, but I see snow, too. At least you have sunshine. There’s a lot of anti-fog grumping going on around here. The geraniums I’ve overwintered haven’t bloomed — not like last year, when they pretty much kept blooming all season. However, some plants I kept in the garage show signs of new green growth, so I’m not complaining! Spring is breaking out, even here in the north end of our area. Does it seem early this year or are the seasons just flying by? You made me curious, so I looked up a post I did last year to see how the dates compare. When I went out on February 16, 2018, guess what I found blooming? Anemones, crow poison, pink evening primrose (just one, but still…), deer pea vetch, lyre leaf sage, cut leaf primrose, Texas dandelion, and spiderwort. That’s only ten days later than today’s date — I suspect I might have found gaillardia, too, if I’d looked in the right place. I think it’s just been so gloomy that we’re not as aware of the lengthening days as we’d otherwise be. Spring seems to be right on track — just wait until we get a few days of sunshine! I think for me in my home garden, the freeze knocked back many of my plants last year and they are growing like crazy this year. Also, some of my azaleas are beginning to open. Native plants are probably better at keeping a schedule. And, the older I get, the faster time goes! How utterly charming. It is perhaps facile to say so, but it is the simple things in life that make us happy. Thank you for visiting, and thank you for the appreciative words. I’m glad you enjoyed the photos, and you’re always welcome here. I have always like that kind of flower! Nice detailed images of it, too. They’re so cheerful, and even within a species the variety can be delightful. The proportion of red to yellow can vary, of course, but I’ve found deep, solid red ones, almost entirely orange ones, and yellow ones. Well, and those lovely pink, as well. They’re fun to photograph, especially since they always have pollinators hanging around. I find them rich and earthy and bright and sunny…..always a welcome sight for sure. They’re like the flowers in old-fashioned cutting gardens — zinnias, bachelor buttons, snapdragons. They feel comfortable to me, and accessible. Friendly. Since 5 a.m., actually — that’s about usual. Me sometimes 6am more often 7 or 7:30…….I admire 5 :) But, you get to see the sun come up over the water before you work or write. That is a nice thing. It is nice, and it gets better as we move toward real spring, and the birds are up and singing, too. Love the Indian blanket (not so much Gaillardia pulchella). Bluebonnets (lupinus havardii) are already blooming down here. Gonna be a great bluebonnet year. Very nice to see all this color, hard to imagine wildflowers blooming already- – here, even the big conservatory in the park froze up, and the gardeners are doing ice sculptures and popsicle arrangements instead. (just kidding about the conservatory, it’s doing fine, they have a huge one here, called Mitchell Domes. One dome is tropical, and one arid – – like a little slice of Baja desert, it’s wonderful this time of year. Knowing your sense of humor, I assumed you were kidding. Well, I was pretty sure. Galveston has one of those tropical domes, too, that goes along with an aquarium and a science exploration hall. They’re great even in our climate. I can imagine what a great way to spend a day it would be in your area. Ha! Your gardeners and conservators must have been reading about how they do things up on Great Slave Lake, in the Northwest Territories. A friend was a doctor up there — she and her husband lived on a houseboat, which was quite an experience when the lake froze — and she often posted about their famous snow castle. During the six weeks or so that it was the center of social life every year, people enjoyed a bar, an art gallery, concerts, ice slides — all the good stuff you’d expect at a castle. If life gives you snow and ice, get building! With our weather getting crazier each year, the plants are blooming at all different times. These gaillardia are a little early, but they have such a nice, sheltered place to grow, it makes sense that they’d be popping up. Otherwise, everything is on its normal schedule. When I looked back at last year, to see which flowers I’d found in mid-February, there were a lot of them. I’d better get my chores done so I can get out there! It’s good to see you “wheely” fired up over the Indian blankets blanketing that ditch. That little area is fascinating. I found ladies’ tresses blooming there in the past — but only in one year. It’s like unwrapping a surprise package every time I stop by. There’s absolutely no predicting what will be there. I rather liked the way the flowers and grasses were tangled up this time — a nice metaphor for tangled seasons. The flowers remind me of sunflowers. They are beautiful. Gaillardia are in the sunflower family, so you’re right to see the similarity. I liked ‘gaggle’ myself. I didn’t think there were enough flowers to qualify as a colony. Calling them a ‘patch’ seemed a little dismissive, and ‘group’ was flat boring, so ‘gaggle’ it was. Besides, I like the alliteration. We call them Blanket Flowers (or Gaillardia) and I love their cheerful faces. They bloom here in mid-summer, but I admit I didn’t know much about them until I read your post. Blanket flower is a good name. They certainly can blanket the hillsides, like this June photo from south-central Texas. It’s one of my favorite photos, taken on my first road trip after getting my cataracts removed and new lenses implanted. I was sure I’d never seen such beautiful flowers. Methinks “pulchella” and “pulchritude” have a root in common. From your pictures, Gailardia is one of those plants with fuzzy leaves. Your closeups reveal fascinating details. You win the prize! Both words are rooted in the Latin for ‘beautiful.’ Your impression of fuzziness is right, too, although the field guide here on my desk describes the stem and leaves as having “stiff hairs.” Fuzzy works for me. The third photo, of the darker bud, reminds me of an open-faced berry pie. I do so love these blooms. They make me profoundly happy (even though I try to grow them and they die!). In a world of gray and ice and such, it’s so nice to see these wonderful colors. A good reminder that all is fleeting. Isn’t it wonderful, how flowers can cheer us? At a friend’s house last Sunday, I spotted some violets blooming by her back steps. They’re not common here, and it’s been a couple of years since I’ve seen some, but they brought back all those memories of May baskets and little bouquets in tiny bottles. As for your firewheel, it may be the flower, rather than you. I looked at a couple of Michigan gardening sites, and they described the flower as “short-lived, late-blooming perennial.” It sounds like their season is much shorter up there than it is here. It makes sense — so throw out that seed, and enjoy them while they’re in bloom. Have you ever tried them at the lake? I’d bet they would do well there, if the soil’s sandy. A hardy perennial it is, and it’s quite capable of a nearly-year-round bloom. By November it’s usually done its thing, even if some stragglers are around, but if conditions are right, they’ll begin to show up again here and there in late January. It depends on which part of the state, too. Many flowers appear down here a full month or so earlier than at a friend’s hill country home. It’s so nice to see spring flowers! Hard to believe from up here at the moment, but a warming sight. Usually at this time we have the first buttercups in bloom, but now they are under a foot of snow which is actually a good thing because it will insulate them from the arctic cold front that has settled in for a couple of weeks. A blanket of snow is more than a metaphor, isn’t it? I hope your buttercups stay nice and cozy, and emerge unscathed when the thaw comes. Even though we don’t have snow and ice here except as occasional topics of conversation (“Say, did you see that sleet that was bouncing off the cars this morning?”) it can grow a little dreary by January. Every bit of color is welcome! I’ve yet to see Gaillardia around here (N. Houston) but spring is starting to awaken many other plants. Just randomly found your blog from a comment on another blog—and I’m so glad! I’m always delighted to find another Texan here, and finding another Houstonian is even more fun. I took a quick look at your blog, and had to laugh in sympathy — we’re all ready for the water to go away. I did see some flowers that are popping out here — the oxalis comes to mind — and one of the ‘weeds’ that you mentioned may be what I saw all along the road to Bellville last weekend. I’ll have to take a better look. I’m glad for the visit — here’s to a beautiful spring! I was surprised to learn Gaillardia can be found in every state. When I see it, I think garden flower or western wildflower. But this same species is in 4 counties in NY – all over the place! Eastern Long Island, the northernmost part of the state, near Albany and in Westchester County, which I’m very familiar with. Maybe I did see it there and just don’t remember. Or maybe the Westchester Co. record is a specimen from long ago. And pulchella means pretty – cool! It has an Italian ring to it. When I looked at the BONAP map, it had the Gaillardia genus listed as adventive in New York — so it’s newly arrived, and you very well might not have seen it. 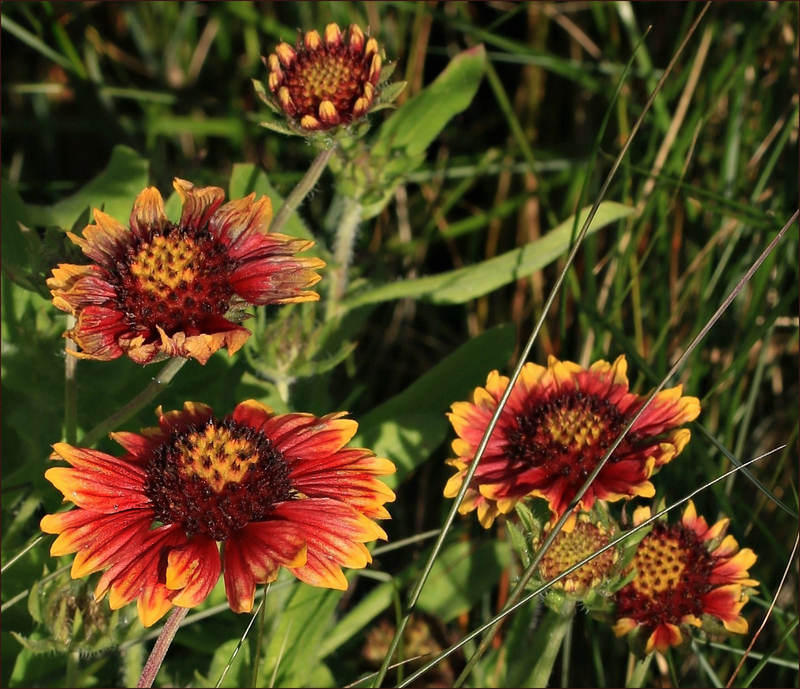 We have several Gaillardia species, and every one of them is beautiful. This one spreads wonderfully well, and there are times when the hills are covered with the flowers. June and July are the height of their season, I’d say — at least, in my experience — and they’re as pretty as can be. They are beautiful! I’ve never seen one before. They’re one of my favorite flowers. Sometimes, a patch of them will get genetically frisky and even produce something like this, which was one of my all-time favorite discoveries. Thanks for the link. That is a very beautiful pink one. They’re among the cheeriest flowers I know. Best of all, they don’t experience any serious disease or insect problems, although they can get root rot if their feet stay wet. I was a little surprised to see that they do well in pots, too, although of course they couldn’t spread as they usually do if put in a container. Gaillardia puchella is found here in New England, but so far not by me, sadly. I am filled with envy seeing that you are finding blooms in late winter while we are still about two month separated from our spring ephemerals. Lucky you and nice pictures too. Those gaillardia were only the beginning; other flowers are beginning to pop up. Granted, there aren’t many, but they’re around. Last Sunday I found the first Indian paintbrush of the year. I found two feral hog carcasses, too: huge creatures, by the looks of their rib cages — they’d been picked pretty clean. A rancher I know just dispatched one that had been wreaking havoc on his place,and it weighed over 350 pounds — the limit of his scale. I’ll stick with the gaillardia — they’re not as threatening. I don’t envy you the hogs. 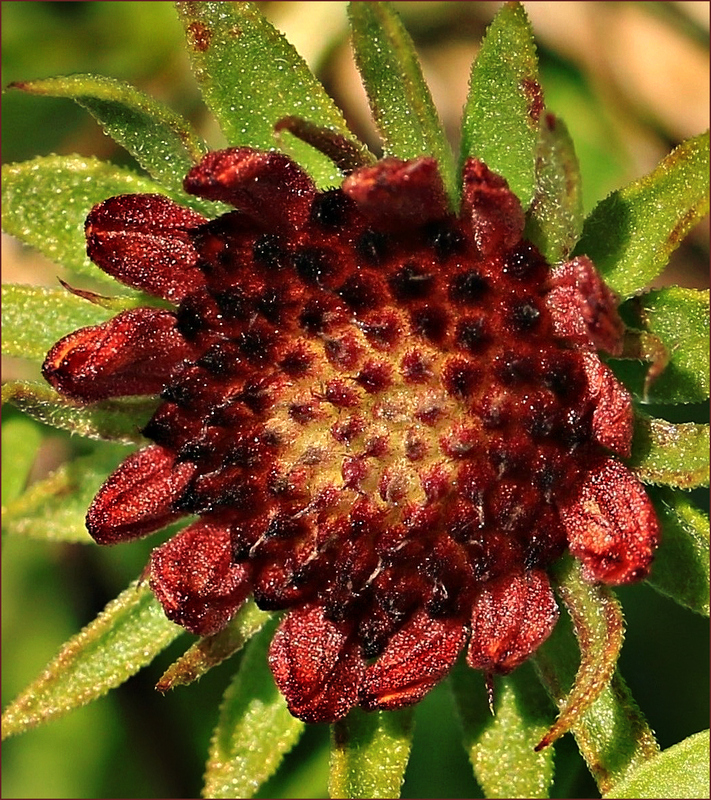 I realize I also have a recent Gaillardia pulchella in my archives. They’re big in Florida also. I got curious as to what ‘pulchella’ meant. It means ‘beautiful little’ in Latin (https://goo.gl/KrZqaW). Pulchella reminded me of ‘pulchritude’ and so I looked them up. 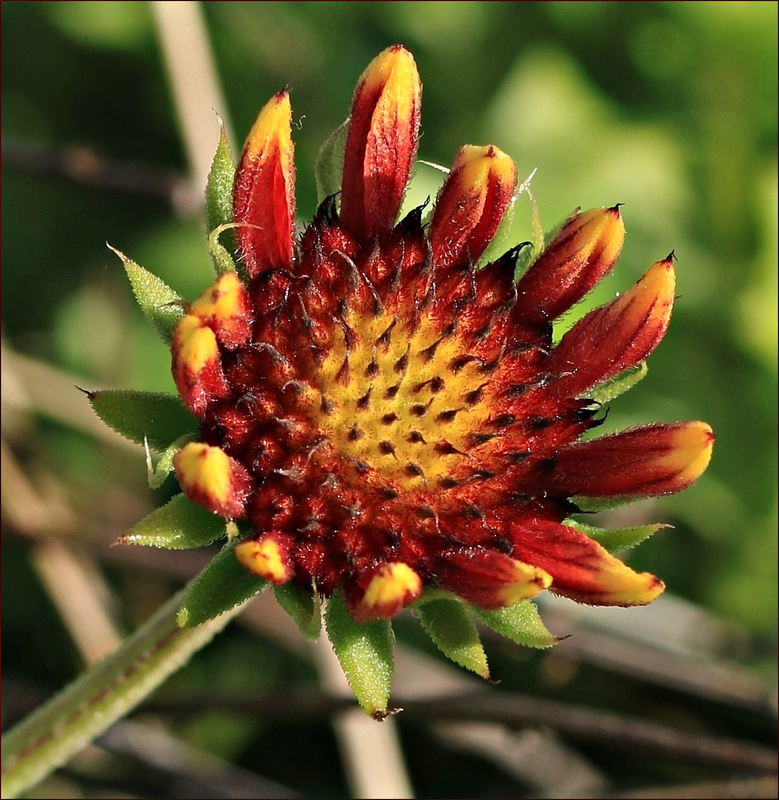 They are indeed related — and there’s no question that the Gaillardia pulchella is pulchritudinous!